Brazilian churrascaria Fogo de Chão has opened doors in DIFC. Founded in Brazil in 1979, the steakhouse specialises in the centuries-old Southern Brazilian cooking technique of churrasco. The authentic dining experience features high quality cuts of meat that are fire-roasted and served tableside by gaucho chefs, and the seasonal Market Table and Feijoada Station, which include seasonal salads, soup, fresh vegetables, imported charcuterie and more. Weekday lunch, Weekend Brazilian Brunch and Fogo Bar and Lounge menus offer guests additional ways to enjoy the Fogo experience at varying price points. Visit fogome.com. 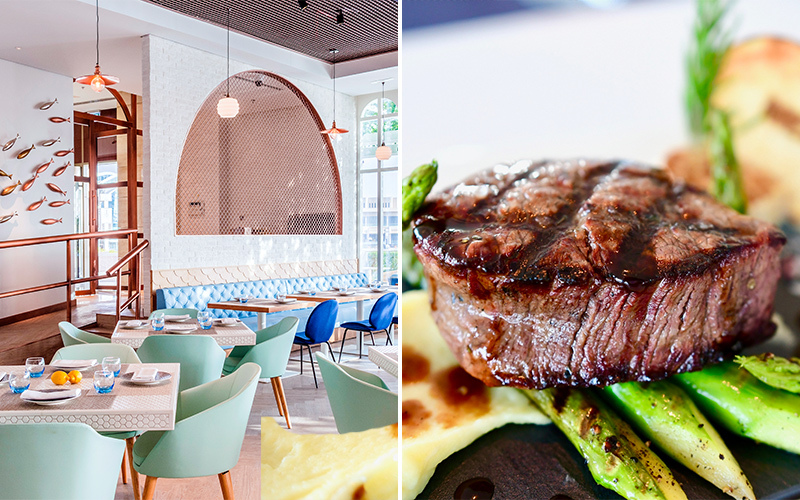 Located at Park Hyatt Dubai’s brand-new dining destination, The Promenade, NOÉPE brings the charming aura of Cape Cod to the shores of Dubai Creek. Paying homage to the very finest of New England’s cuisine, utilising specially sourced ingredients, signature dishes include the likes Maryland crab cakes, lobster mac n’cheese, made from the highest quality produce fresh from Maine, immersed in a rich fontina cheese, and lobster sliders, taken from the street side of New England and given an upscale twist. Call 04-6021814. Bringing the streets of Japan to Shangri-La Hotel on Sheikh Zayed Road, ONI Japanese Restaurant opened last month. An ode to street-style delicacies from Japan, ONI offers a laid-back, welcoming atmosphere and menu classics such as sushi, robata and ramen. Visit onidubai.com or call +971 (0) 4 405 2333. American family-friendly restaurant, Texas Roadhouse has opened at Dubai newest beachfront location, La Mer. Combining authentic barbeque techniques with fresh ingredients and a selection of succulent cuts, this all-day dining destination offers a steakhouse-style menu with a Southern flair. Enjoy made-to-order 100% halal hand-cut steaks, and delicious fall-off-the-bone ribs, complemented by made-from-scratch sides and freshly baked bread, while enjoying western interiors that’ll remind you of a Texan neighborhood barbeque, complete with live country from the staff’s entertaining line-dancing routines every hour, on the hour, inside and outside. Call 04-4190914. From March 25 – 31, experience flavours from over 10 different gastronomies with the launch of JW Marriott Marquis Dubai Restaurant Week. From fine dining to casual dining set-menus there is something for everyone. Head to one of the hotel’s pubs or bars including Bridgewater Tavern (trendy sports bar), Café Artois at Bridgewater (outdoor terrace at the Dubai Water Canal), La Farine Café & Bakery (French restaurant), Aqua Poolside Grill & Bar for Dhs130 per person for a set menu. Keep it casual at Izakaya (Japanese restaurant), Positano (Italian restaurant), or Garden (Peruvian restaurant) for Dhs130 per person, or go fancy at one of the fine dining outlets including Prime68 steakhouse, Tong Thai (Thai restaurant), Rang Mahal by Atul Kochhar (Indian restaurant), for Dhs190 per person for a set menu. For more information, call 04-4140000. A brand-new fish and seafood focused restaurant has opened at Dubai Festival City’s prestigious waterfront. Inspired by local heritage and the simplicity of diligently sourcing the freshest produce, The Fish House prides itself on delivering an authentic dining experience, accompanied by a social and warm atmosphere. “The centrepiece of The Fish House experience is our signature raw bar which houses our charcoal and wood grill, allowing our team to prepare your meal right at the heart of the venue,” explains Ben Nicholas, Restaurant General Manager. The cold bar houses the catch of the day on ice, enabling diners to interact with the chef whilst choosing how they would like to customise through cooking style, side and sauce. Options include deep fried, pan fried, poached, oven baked, breaded and barbequed, offering something for everyone. Call 04-7011127 or e-mail thefishhousedubai@ihg.com. Start the week fresh and enjoy a long lazy evening watching the sun go down at Riviera’s Seafood Sundays. Choose your live seafood catch and get special rates from Riviera’s head chef. Fish and seafood lovers are sure to leave satisfied, with options like red snapper, black cod fillet, butterfly prawns, and lobster all on the menu. Every Sunday from 7pm to 11.30pm. Call +971 5 2777 9473 or e-mail reservations@riviera-grill.com. Details: if you enjoyed this article, you may like this article on how to take the best food photos on your mobile phone.